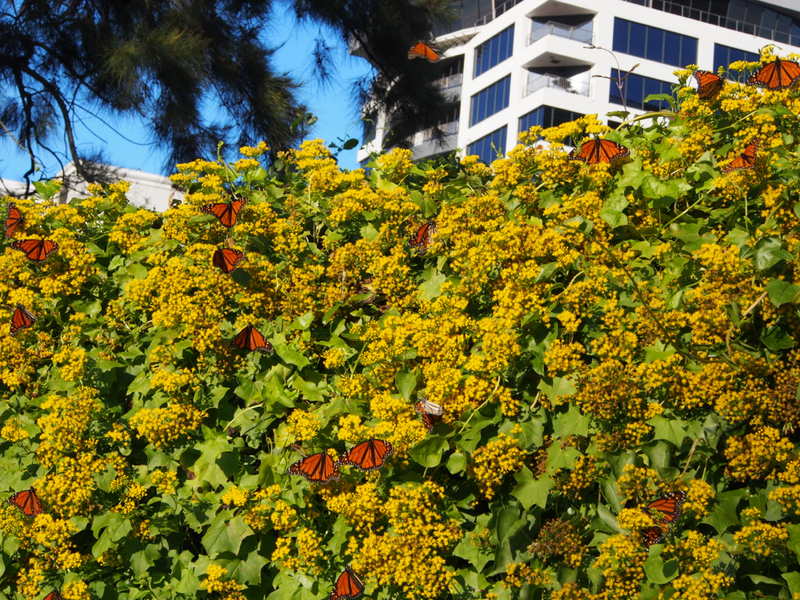 What a mesmerising sight of colour and movement caught my eye when visiting an Auckland park this July – over 50 monarch butterflies dancing and feeding on the yellow flowers of the naturalised german ivy (Delairea odorata). 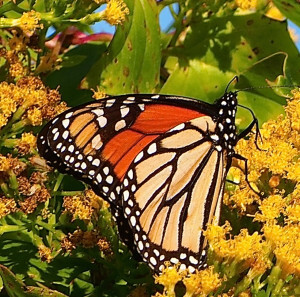 The monarch butterfly (Danaus plexippus) is New Zealand’s most identifiable butterfly. We consider it a native because it was self-introduced in 1870s having ‘island hopped’ from North America. Not only that it is dependent on the introduced swan plant (also known as milkweed) for survival. 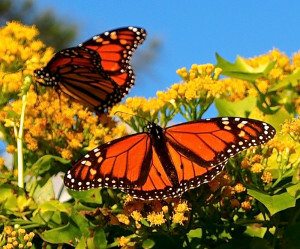 Monarchs here do not follow the same migration pattern as their northern relatives where they can travel up to 9,000 km to winter over in Mexico. This incredible migration has recently been disrupted through climate change and loss of habitat. 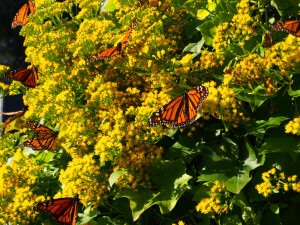 New Zealand monarch’s have adapted their migration behaviour to suit local conditions. When the air temperature drops to 12.8°C, monarchs flock together in overwintering sites. These sites tend to be in milder coastal locations where the temperature remains at least 10°C. The generation of monarchs that are born in autumn don’t mate till spring and live longer (6-9 months) than previous generations which live between 4-6 weeks. 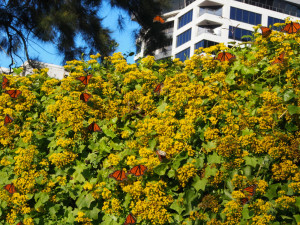 When the temperatures warm up, butterflies move inland to reproduce. Monarchs use bright colours and the toxicity from their larval swan plant food source as defence mechanisms. This is enough to keep vertebrate predators away, with the exception of the shining cuckoo. 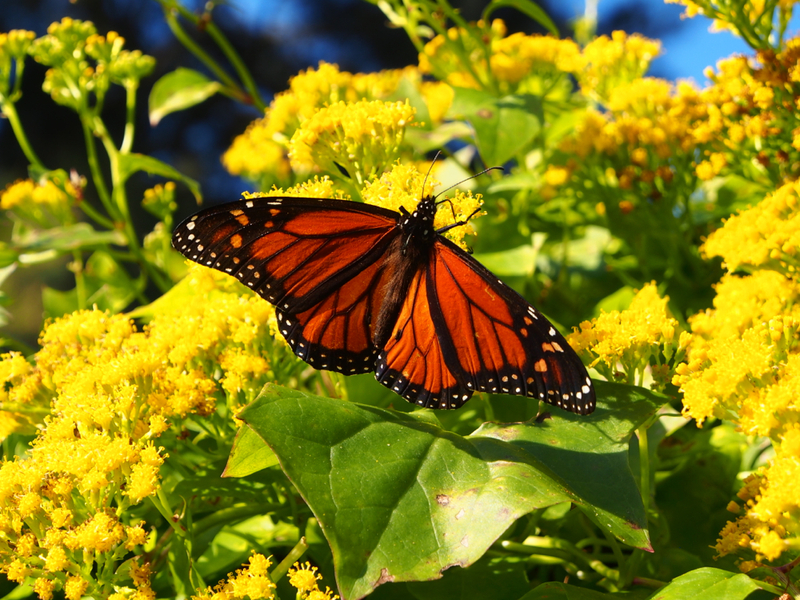 Males are a bit bigger than female monarchs and have a spot known as the androconium in the middle of each rear wing. Wings of females boast of darker veins. Finding a resting site of hundreds of monarchs is such a ‘wow’ experience – the vibrant colours, the beauty and grace and a chance to study them closely as they rest up ready for the next stage in their cycle. My wife fern raised over 300 monarchs last year this year we added a second shade house and shes aiming at 500 from about 250 swan plants we live in Auckland. Hopefully someone picks up your request and offers a home for your caterpillars. Sorry I can’t help – I live in Christchurch. Alternatively maybe a nursery near you is selling swan plants and you could grab one and transfer the caterpillars over. All the best. Wee took in the last 4 surviving caterpillars from our swan plants when the weather turned bad here in Christchurch. We put them n a shoe box and sure enough they all formed chrysilises (?) and now the first one has pupated and is hanging around in our living room. I have put out an eggcup of honey water for nectar and am hoping that they may spend the winter here until the spring comes. Is my hope real or misplaced do you think? Hi what is the plant called the monarchs feed on during the winter i have 1 of a group of 6 that have hatched the others have been set free a couple of weeks ago its getting quite cold now and being in the lower north island its not warm out side so i have her inside and ive ben giving her clear fruit juice . syrup plus a mixture of honey water and a drop od soy sauce plus some water also i may keep her over the winter inside so just wondering what else to feed her ,thats why i asked what the plantis they feed on over winter ,i have heebes but they have long sice finished flowering i took her out side yesterday in the sun but she is quite happy to say with me . “Adult butterflies need plants giving nectar. They usually choose flowers with bright colours, purples, pinks and blues in mass plantings. Buddleias and Hebes are very popular. There are more listed in our forum – click on the link on the homepage to go there. There is a poster showing many nectar plants available from the MBNZT.” All the best with this! We are also keen to hear of other sightings which can be noted on our site http://www.mb.org.nz. I had a swan plant in New Plymouth on which grew 3 large caterpillars until they devoured the whole plant. I get them on pumpkin for a couple of weeks until they disappeared. Several weeks later I noticed a Monarch butterfly on a rosemary plant near to where I had the swan plant. It has stayed there for 2 days.I would like to think it was one of my “babies” I looked after!